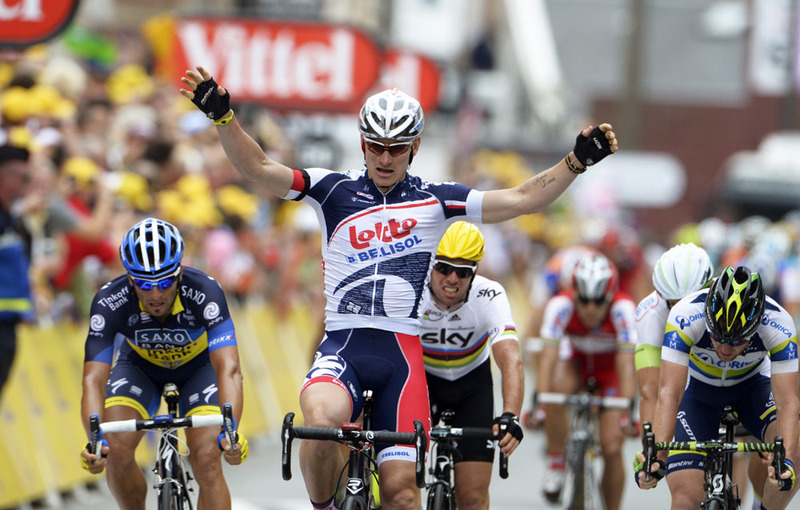 Andre Greipel (Lotto-Belisol) won his second consecutive stage of this year’s Tour de France after another crash-affected sprint into St. Quentin. In a final few kilometres complete with puddles and a speed-sapping rise in the road, the German powerhouse showed a deft touch to navigate his way to the line after yet more fine work from his Lotto team. After catching the four man breakaway just 600m from the line, Matt Goss (Orica-GreenEdge) came a close second and Juan Jose Haedo (Saxo Bank – Tinkoff Bank) was third. Mark Cavendish (Sky) had to settle for fifth after he ran out of team-mates with one kilometre to go and quickly lost position at the head of the bunch. His effort to bridge up to Greipel and Goss, the latter opening up the sprint, seemed to take its toll on the World Champion who was missing his trademark kick to come around his rivals. On what was already a bad day for Garmin-Sharp, one of their riders appeared to cause a crash in the final 2km which took out green jersey Peter Sagan (Liquigas-Cannondale), although the young Slovakian was unharmed. 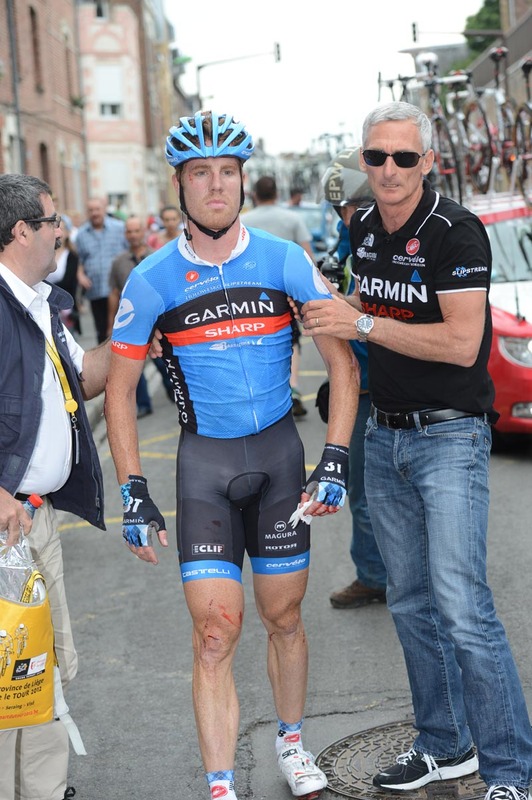 It later was confirmed that the Garmin rider was Tyler Farrar, whose diabolical Tour took another bad turn as he was boxed in by two riders from Lampre-ISD and Argos-Shimano and fell. He crossed the line in last place and covered in cuts and grazes. The General Classification with Fabian Cancellara at its head remained unchanged as the three kilometre rule meant all riders finished on the same time. The Swiss star has now won the most yellow jerseys of any rider who hasn’t won the Tour. With no classified climbs on offer, today was the first true sprint stage in the 2012 Tour, although the day’s break of Matthieu Ladagnous (FDJ-BigMat), Pablo Urtasun (Euskaltel-Euskadi), Jan Ghyselinck (Cofidis) and Julian Simon (Saur-Sojasun) clearly had other ideas as they forged clear in the first kilometre. After Greipel’s win into Rouen yesterday, it was Lotto-Belisol who took up the chase once the gap had stretched to 5’40” at the 52km mark. Cavendish whetted the appetite for the finish as he took fifth in the intermediate sprint behind the break and as the finish approached and the thunderstorms in the air abated, more and more teams formed their trains including Sky and BMC. The British team with Cavendish and Edvald Boassan Hagen at the rear were clearly working for Wiggins and the relative safety of the 3km mark, as the World and Norwegian champions found themselves somewhat isolated at the front of the bunch with just over one kilometre to go. With the break dangling ahead of the peloton until the final few hundred kilometres, it was a thrilling finish to a routine stage as a well-drilled Lotto lead-out delivered their on form sprinter to the win.